Form is a plant-based nutrition brand intent on shaking up a protein supplements market expected to reach $21.5bn globally by 2025. Co-founders Damian Soong and Natalia Bojanic share how they're breaking category conventions, what Form's acquisition strategy is and why we're seeing a resurgence of minimalism in the brand world. What was the opportunity for Form? DAMIAN: Brands in this crowded protein space are all doing the same thing and it's boring. You have either badly graphically designed products with garish colours and muscle men on big horrible plastic tubs, or you have these crazy hippy brands. As someone interested in premium brands, design, architecture, all of these things, there were no lifestyle or aspirational performance-driven products that appealed to me. NATALIA: One of the challenges was to make a plant-based protein shake that tasted good just with water, because most of them don't. It took nearly a year to source the right ingredients and formulate the product, but this tastes good, it’s plant-based so it's better for the planet, and it's good for you. The main ingredients in Form's range of protein powders are pea, rice, hemp and algae proteins. DAMIAN: We've tried to elevate the whole idea of nutrition. We didn't think of nutrition just as a protein shake after the gym. We thought of nutrition as nourishment for your whole self - your body and mind. And when you broaden that definition, you realise that nutrition is so much more. Hopefully, that's set our brand apart from the competition. It's a crowded space. So this has been important for us. NATALIA: We never tried to fit in. Our aim was to do something that felt authentic to us, and that way, we would stand out, and as Damian says, that makes the competition irrelevant. We have this mindset to do things differently. You can see that in our packaging, the sponsorships we do, and from our nourishing of the mind and not only the body. People can smell when things are not genuine. 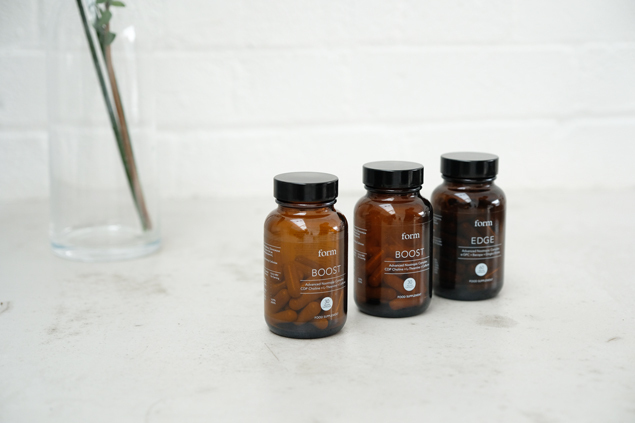 Form's Nootropics capsules. Nootropics are a class of compounds that has been proven to improve some aspects of cognitive abilities. Tell us about Form's driving belief or tag-line that 'We can realise the greatest version of ourselves while being mindful of others'? How did you arrive at that? NATALIA: There's a mindful element in everything we do, from carefully selecting the ingredients that goes into our blends, to having Dr. Adam Collins, a PhD in Nutrition help formulate them, to donating a meal to a family in need for every product sold. It's a holistic approach to business. Consumers too are more conscious about the impact dairy has on the world and realise that plant-based is better for the planet. Why do you market Form as plant-based, as opposed to vegan? NATALIA: I think the plant-based approach comes from a place of compassion. I understand that when people are pioneering a movement, there's a lot of energy, there's a lot of anger, but no one likes criticism. No one likes to be told what to do and how to eat. The plant-based approach is more inviting. Why demonise the consumption of animal products? I think that way of communicating is more appealing. Form is 100% vegan although marketed as plant-based. So the pack design is a key part of how you differentiate yourselves. Talk us through the thinking and process behind that? DAMIAN: We got rid of everything superfluous. The packaging and the copy is as minimal as can be. We went through the design with our designers to see what we could remove. Aesop is a beautiful brand. It's packaging that you're not ashamed to have on display on your worktop or by your sink. We wanted to create something pared-back and beautiful amongst a landscape of unbelievably bad design. NATALIA: We also live in a world where we are constantly bombarded and overstimulated with information. When you look at the packaging we want to create a moment to relax, to breathe, to not have to think. Keeping things simple and coming back to the basics is pleasant for the eyes. We want to help those brains overflowing with stimulus. Form is part of a wave of new brands with minimal branding and pack design. What do you see as driving that resurgence of minimalism in brand design? DAMIAN: Minimalism has become popular again now in terms of a lifestyle and that's informing brands and the way they design. As a lifestyle, it probably comes back to the rise of conscious consumerism. Globalisation has failed for a lot of millennials. They're not saving for a deposit, they’re spending on experiences and traveling, and more interested in looking after themselves than buying material things. What is Form challenging or trying to change in the world? DAMIAN: It's important for us to acknowledge that thinking about nutrition in such detail is a massive luxury when many people don't have enough food for a healthy life. So it's very important to us to incorporate giving and a way of giving back into our offer. So with every product that we sell, we feed someone in need via our family feeding fund in the Gambia. The fund saves and changes lives, and that's an amazing thing. 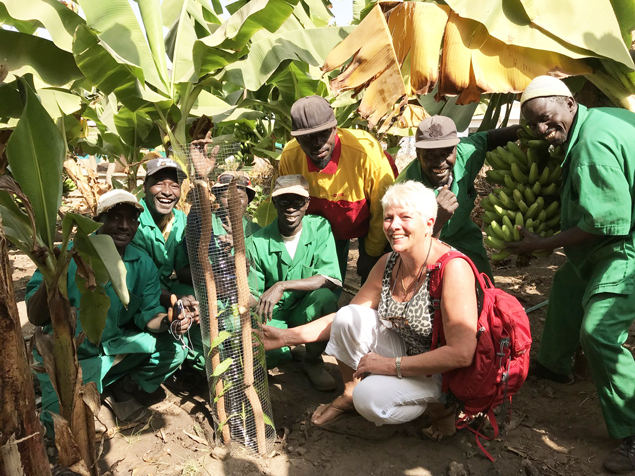 Anita Smith MBE and staff planting banana plants to provide food for patients in need at The Bansang Hospital in The Gambia. What is your acquisition strategy? I see you've reached 18k followers on Instagram in a very short space of time. How do they become customers? DAMIAN: 80% of our customers find us first through Instagram. I think ultimately it's about providing value. We've not really ever tried to sell our protein. We’re just helping to guide and educate people around nutrition and hopefully positioning ourselves as trustworthy and an authority. So when someone realises they want a protein or cognitive supplement, we're front of mind in terms of their thought and buying pattern. NATALIA: We believe it’s much more genuine to have supporters rather than followers. That's why paying digital influencers was not something that we felt comfortable with. It's working out because our supporters genuinely like the product and recommend us. That's a very privileged position to be in. It shows that taking the time to develop a brand with responsibility and care pays off. What has been the proudest moment on your journey so far? NATALIA: A real turning point for me was reading an email from Anita, the lady who runs the charity at The Bansang Hospital in The Gambia. To see our work helping people in another continent, on the other side of the planet, by providing food items like boiled eggs and bananas, and that these are their luxury items. Having real impact on people's lives really gives me more motivation to do what I do. It's early days, but what has been key to your success so far? DAMIAN: We're not a big faceless brand. People can come and meet Natalia and I and interact with us on social. That's important for a more conscious consumer now. Proctor & Gamble, Unilever, it's more difficult for the big conglomerates. They’re not struggling, obviously, but how do they deal with this influx of brands like us? It's a big question for them. We're not trying to challenge them... but give us a chance and we might.